Designing a basement bar idea is one of the most desirable things you, as a house owner, can do for your den. Especially when you got lots of friends who like to party on weekends, you can have your basement as an alternative venue. Even for just the simple joy of hanging out, the basement is a perfect spot. What makes a basement more enjoyable to hangout with is when you know people like it too. Having an idea and turning it into a reality is one thing that gives you that sense of fulfillment. The conversation doesn’t seem to end. Here are some things you need to set it up. Sink. Install your sink in a corner near your plumbing system. This is will make it easier to install. Since all ends of the plumbing system in your house leads to the basement, might as well set up your mini bar there. Your wet bar is where you wash stuff or drain all excessive spills into the sink. Liquor shelves. Having a liquor shelf in your basement bar is essential since you’ll be serving drinks in the room. Place your liquor shelf in an area where the temperature is consistent. This will help as most of the wine and other liquor types are temperature regulated. A basement bar idea can never be complete without this. Keg, cooler, and a refrigerator. Consider installing a beer keg shelf under your bar if you’re thinking about serving beer. It’s safe and it’s easy to manage. Some bar units have a built-in keg cabinet. An alternative to the beer keg is a cooler to put your beer bottles in. However, coolers can also be messy after the party. If you don’t like coolers or keg, put a mini ref in your basement bar. But these are also must haves for a basement bar. The bar. Obviously, a basement bar can’t be without the bar! You have a choice of building your own. Some carpentry skills and a little time in your weekend schedule is what you basically need. This is most practical when your budget is tight. However, if cash is not a concern, buy one. 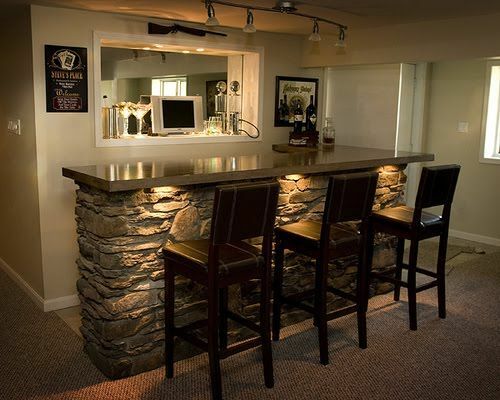 There are a lot of different types of bars that suits your basement bar idea to choose from. A bartender. Add an experienced bartender to your basement bar. However, this can add to your overhead cost. If you have a friend who knows how to mix concoctions, send him in. But if you don’t, the next best option is to study this art of mixing drinks. The fun part is when the party begins. Having this is your plan completes your basement bar idea. Some basement bars can be quite a well-designed that they don’t even look like basement at all. The designs are so good you might think it’s a bar in a hotel restaurant. The point is that all you need is a good and clear vision of how your bar should look like. Your basement bar idea is your key to make it happen. When it’s done you’ll be the envy of your friends and neighborhood. About the Author: Hunting for a basement bar idea? Discover the best tips on basement remodeling ideas from the best sources on the web.